"My cat keeps going to and fro the litter box, meowing painfully," the owner said. 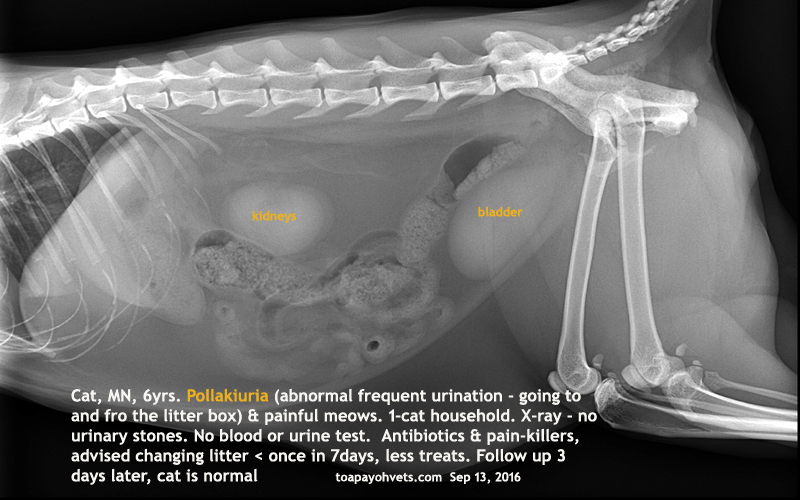 "Your cat has pollakiuria which is an abnormal frequent urination.," I palpated a small bladder, hence no urethral obstruction. "How many cats are there in the apartment?" "One cat only," the owner said. "Did you change the dry cat food?" I asked. "No, but I gave him more cat treats recently," the owner showed me a packet of Friskies Party Mix cat treats given for the past 1 month. "Did you change the litter often?" I asked. The owner had not changed the litter for around 7 days or more and had not picked up the stools. It is possible that the cat was stressed and this could cause FUS (Feline Urological Syndrome). X-rays showed no urinary stones. Blood and urine test was not done to lower medical costs. 3 days later, I phoned. The cat is back to normal and the litter is changed regularly and often. 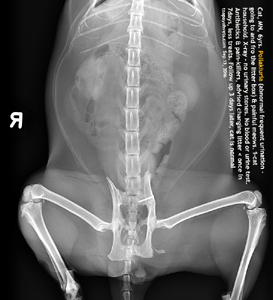 Early vet consultation and treatment enabled the cat to recover the next day.